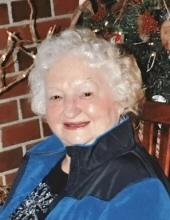 Nona Emory Knight passed away peacefully Thursday, February 7th , 2019, at age 88. Nona was born on September 25th , 1930 to the late Luther and Ruth Yates. In addition to her parents, Nona was also preceded in death by her husbands, Dallas Emory and Lawrence “Buck” Knight, and her children, Nona Lisa, Gerri Rose Kennedy, April Marie Poe, and 8 siblings. Nona is survived by her children, Connie Thompson (Leonard), Carol Bolick (David), Miles Emory (Gail), all of Hillsborough, Anthony Emory of Port Orange, FL; grandchildren, Leonard Thompson, Renee Lee (Scott), Stephanie Clayborne (Wayne), Jeff Bolick (Lauren), Greg Bolick (Melanie), Jamie Hutter (Eddie), Bill Kennedy (Tracy), Kevin Kennedy, Jerry Emory, Rodney Emory, Robert Emory (Ashley), Amber Balog (Greg), Angela Walker (Bryan), Dallas Emory, Phillip Emory, Crystal Denson (Chris), David Fletcher; 35 Great Grandchildren; and her sisters Virginia Whicker (Bill), Phyllis Seaman, and Deborah Ira (Chuck). Nona resided in Hillsborough all of her life, surrounded by family. Nona was a beloved wife, mother, grandmother, and woman of faith that always prayed and thanked God for all of her blessings. She was blessed and truly lived life to the fullest spent with her children, grandchildren and great grandchildren. Nona enjoyed many hours fishing, playing and winning card games especially with her grandchildren but the most she enjoyed was witnessing for the Lord. The family will receive friends from 6 to 8 p.m. on Saturday, February 9th at Clements Funeral Home in Hillsborough. A funeral service will be held at 2 p.m. on Sunday, February 10th at Gospel Baptist Tabernacle with Pastor David Bolick officiating. Burial will follow the service in Palmer’s Grove United Methodist Church Cemetery. Pallbearers will include Nicholas Lee, Seth Thompson, Bradley Thompson, Matthew Kennedy, Cody Chamberlain, David Hutter and Ryan Bolick. To send flowers or a remembrance gift to the family of Nona Mae Yates Emory Knight, please visit our Tribute Store. 1211 Palmer's Grove Church Rd. "Email Address" would like to share the life celebration of Nona Mae Yates Emory Knight. Click on the "link" to go to share a favorite memory or leave a condolence message for the family.